Playing for free at 1196 Queen St West is Intent City. 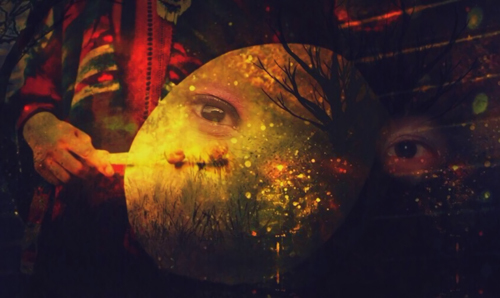 Part of the Live Art series at the 2016 SummerWorks Festival, this performance piece combines live music, video projections and audience input in the forms of pre-recorded sound bites answering the questions of what is your intent on this land and how can we shape the future together for Indigenous people? If you’re interested in having your input be a part of the performance, you are encouraged to email info@eventualashes.com in order to schedule a sit down to have your sound bite recorded. You’ll be discussing the reconciliation and emergence of the Indigenous people, what it means to be an ally, and what kind of imprint you wish to leave on the land. I did try sending an email earlier today to get my sound bite recorded but did not receive a response. Best to inquire the day before. Gein Wong ran the technical aspects of the show — pairing video imagery with the pre-recorded audience input sound bites. I, unfortunately, did not find the video very interesting. It’s a lot of grass land and a few street signs, nothing all that visually appealing. The audience answers were certainly more mentally stimulating, it’s interesting to hear people’s opinions on such topics even though the answers were all similar. My favourite part of the whole show was the music provided by DJ Classic Roots and Red Slam Collective. The music was hip hop fused with Indigenous rhythms and chanting. The songs with lyrics both sung and rapped by the talented Mahlikah Awe:ri were deep and resonating. If anything, checking out Intent City is a great opportunity to just go and see Red Slam Collective perform live. I believe my biggest disconnect with this performance piece was that it didn’t seem cohesive. The elements of the music and the audience sound bites are intriguing and thought provoking individually but together, it didn’t blend in any seamless way. Aside from the music, it didn’t capture my attention. But Intent City is a free performance and Red Slam Collective are a great live act and for that reason alone, it’s worth checking out. Intent City plays at 1196 Queen St W.
Director’s Note: Intent City is a work in progress where we are experimenting — not all elements of the show will be performed in one showing. The creative team will be growing and changing the show throughout their SummerWorks run. Intent City is free to attend. However, individual SummerWorks tickets for regular shows are $15 at the door (cash only). Youth Series tickets are $10, Live Art Series ticket prices vary. Tickets are available online at http://summerworks.ca, by phone at 416-320-5779 and in person at the SummerWorks Central Box Office – located at Factory Theatre (125 Bathurst St). Open August 2-14 from 10am-7pm. Cash and credit accepted.